The Beaver River Canoe Route travels 14 miles through a series of reservoirs on the Beaver River and includes six portages that total just over two miles. Paddlers usually take two days to complete the route, camping at primitive island campsites on the Soft Maple or High Falls Reservoirs or at the formal campground on Soft Maple. While some moving current can be expected, the route is primarily flatwater, and no whitewater skills are necessary. It is possible to extend the route both upstream and downstream, but this adds significant mileage to the portages. Beginning at the Moshier Falls put-in, drop your gear right by the river edge at the Moshier Falls Powerhouse and park at the parking area about a quarter mile back down the road. Sign in at the trail register. Paddlers may be interested in taking a short walk behind the powerhouse to see the unique wooden water tower and the dewatered river bed just behind the power house. A short and informal trail parallels the river bed along the four-stage Moshier Falls. Each labor day weekend this stretch becomes a popular destination for whitewater kayakers from all over the Northeast. Once on the water, paddlers will paddle underneath a bridge accessing the Pepperbox Wilderness and into Beaver Lake. Beaver Lake is the largest and wildest of the still waters on the route, and there are several coves to explore in addition to the swampy lowlands on the south end. As you travel north and west, more and more houses appear on the shore. For the fastest route through, bear to the right after the lake opens up. The route narrows as you approach the Eagle Reservoir, where large outcroppings of rock become more frequent along the shoreline. As you approach the dam at the northwest end of the reservoir, bear left to begin the three-quarter-mile portage. This is yet another section popular with whitewater paddlers during the fall releases, and it is also popular with climbers throughout the year. Keep your eyes peeled during the portage and you may see them topping out between the trees. 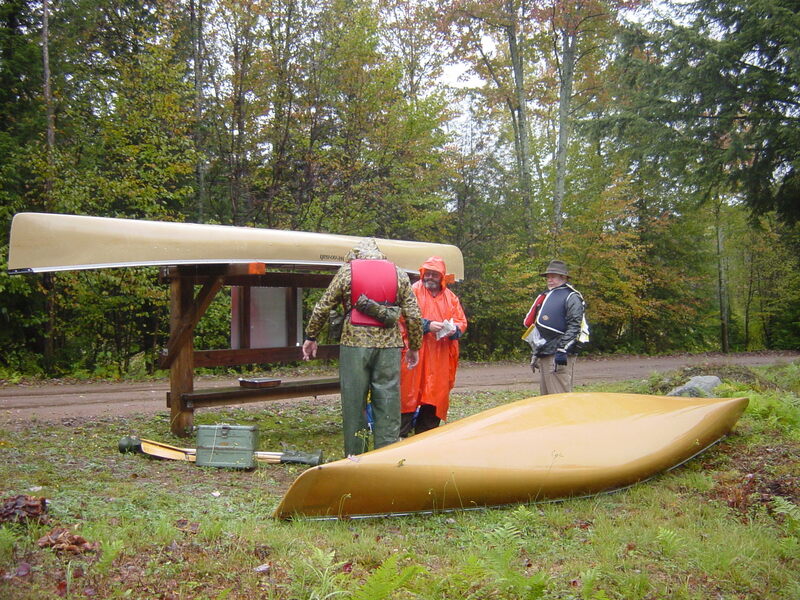 The portage follows a dirt road down a long gradual hill, with one canoe rest along the way. Near the bottom, continue following the dirt road to an intersection, turn right, and follow signs for the Beaver River Canoe Route. The next reservoir is the Soft Maple Reservoir, where most people camp. There are two islands with primitive campsites, one of which has a rope swing. There is also a formal campsite on the western shore near the dam, with restroom and shower facilities. The formal campground requires a fee. Continuing along the route, paddlers will head straight for the large earthen/gravel dam and turn left to follow a narrow channel under a bridge into the Lower Soft Maple Reservoir. Several luxurious cabins line the banks here, and before long, you will reach your next portage. From just above the next hydropower intake, paddlers will portage up a small hill and then down a steep trail to a road, then turn right to reach the clearly marked launch point. Watch for poison ivy here. This portage is about 500 yards long. You will begin paddling again at the upstream end of the Effley Falls Reservoir where the river begins to narrow and widens gradually. It’s about 2.5 miles to the next portage on the right hand shoreline at the Effley Falls Dam. Here you’ll find a 260-yard portage down a gradual hill to the upstream end of the shortest reservoir yet, Elmer Pond. After a quarter mile of paddling, paddlers will begin a 130-yard portage around the dam on the right-hand shoreline. Once back on the water, paddlers will enjoy a narrow stretch of river that opens to yet another large reservoir with a privately owned island in the middle. This is the Taylorville Reservoir, and there are 1.5 miles of paddling between portages in this stretch. The portage around the Taylorville dam and dewatered riverbed is the longest at 0.8 miles. This portage once again follows a gravel road around a section of riverbed that is a popular whitewater kayaking destination during release dates. The picnic tables at the start of the portage make this a great place to stop for lunch on day two. There are two canoe rests along the way to the next put in on the Belfort Reservoir. Another short paddle, the Belfort Reservoir, is about a quarter mile long and is followed by a 300-yard portage beginning near a fishing deck, crossing a bridge, and continuing down a steep hill. The final stretch of the Beaver River Canoe Route most resembles a river as it snakes its way toward the High Falls Reservoir. Cows can often be found grazing along the shoreline, and agricultural fields are a sure sign the river journey is approaching its end. A handful of primitive campsites await on the islands at the High Falls Reservoir in addition to the takeout at the top boat launch on the northwestern shore behind the islands.